The courses take place in modern air conditioned studios at Centro de Baile, 15 minutes from the centre of Jerez. Classes are held in the morning when the day is cooler. All classes are accompanied by local professional guitarists and singers. After class you can relax or explore the lovely narrow streets and shady squares of Jerez, visit a Moorish castle or the Flamenco Museum. Beautiful beaches are only 20 minutes away and the fabulous city of Seville only an hour’s journey. By night experience the vibrant atmosphere of the many bars and restaurants of Jerez, taking in the flamenco haunts normally off limits to foreign visitors. 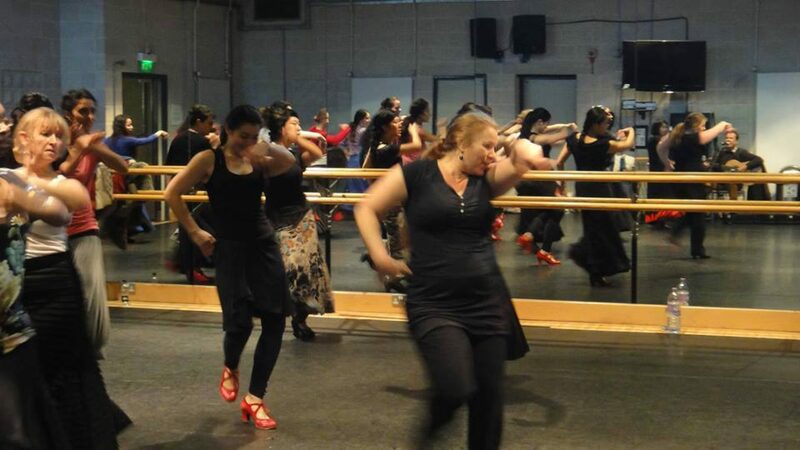 Return your form with course fees to Escuela de Baile, 35 Tintagel Drive, Stanmore, Middlesex, HA7 4SR. You will receive confirmation along with an information sheet. The course is extremely popular and only prompt booking can ensure the course of your choice. Please phone if you are unsure of your level. More information is available on by calling 020 8905 4554 / 07795 166 590 or emailing info@ledb.co.uk. You can fly directly to Jerez with Ryanair. You can also fly to Seville which is about an hour away from Jerez by train. You must book your own flights. Hotels: We recommend these Hotels for your stay over the course. Please note that Hotel Guadalete is only a few minutes walk away from the studio and Hotel San Andres is in the very centre of Jerez and is a 20 minute walk to the studio or a short bus ride. The course takes place at the Centro Baile de Jerez, c/Velazquez num 24, San Gines (plg San Benito) Jerez de la Frontera. The website of the Spanish school is www.academiadebailejerez.com (in Spanish) For any enquiries please call 020 8905 4554.